Debbie, who’s been weaving baskets for over 20 years, recently expanded her skill set to include creating custom-made brooms. She studied at the John C. Campbell Folk School in North Carolina, learning how to make various styles of brooms, from functional to decorative. Debbie’s brooms are perfect for gifts and for special occasions, such as the wedding brooms she crafts for Jumping Over the Broom ceremonies. Her latest creation is the Aura Sweeper, which is a multi-colored whisk broom whose handle is decorated with crystal beads. 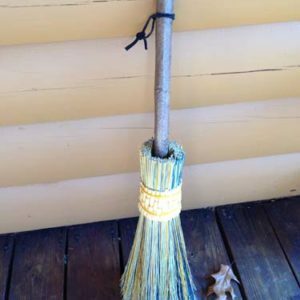 This broom can be used to clear the aura or energy fields around people and in rooms. 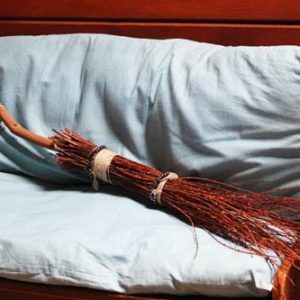 It’s also been successfully used by parents as an “enchanted” broom to scare away those monsters from night terrors preschoolers experience. All of Debbie’s brooms are made with natural materials. Her besom brooms use the willow twigs she grows and harvests here at Serendipity Meadow; for a softer option, she switches out the willow twigs in the brush part for broom straw. Handles are wooden, and constructed with the rustic look of natural wood whose bark is intact, or the more refined look of sanded wood with a finish. 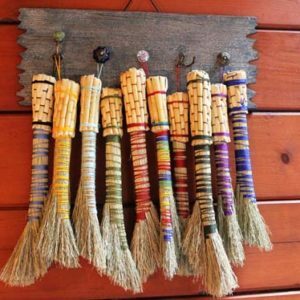 Debbie customizes the types of materials used for attaching broom straw or twigs to the broom handle, as well as other elements like crystals, feathers, suede cording, and jute, and hand dyes the broom straw to add color and contrast to her creations.